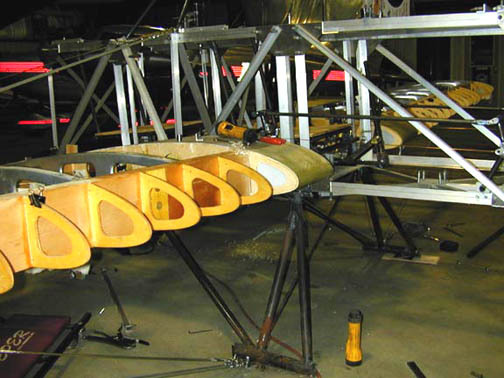 In May, 2003, William David sent me this pictures of the two-seat homebuilt that he's designed and is building. Its Fly Baby heritage is obvious, from the general configuration to the shape of the tail feathers to the wire-bracing of the wings. However, he has taken some significant departures. I've always wondered about how the Fly Baby should evolve; with aircraft-quality wood becoming scarcer and more expensive, and the prices of hardware like turnbuckles going through the roof. David has picked a direction that might be of interest to Fly Baby fans. The fuselage is made of aluminum angle, bolted and glued together. 1/8" angle is used, either 1 1/2" x 1 1/2" square or 1" x 1". I had considered, in the past, trying aluminum tube like the Murphy Renegade, but admit that the angle was not an approach I'd thought about. 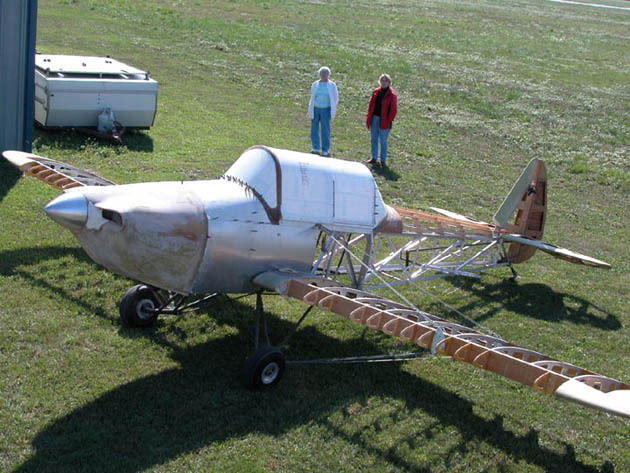 It's been successful on several homebuilt designs, notably the Bede BD-4. It's even been used on production aircraft.... the N3N WWII Navy training biplane, for one. It is a simple, rugged construction method. It's interesting to note the price difference is still, really, on the side of wood...Aircraft Spruce lists 1"x1" spruce for about $1.60 a foot, but the 1"x1" 1/8" aluminum angle is about four times that. But the angle is probably easier to work with, and will probably be a lot more durable. The landing gear is another interesting approach. David used a variant of the "split" gear that Bowers discusses in the Fly Baby plans, but does not run the flying-wire anchors through the wheel hubs. This allows him to give the wheels some travel for shock-absorbtion. The gear has torque rods through concentric tubes, and gets about five and a half inches of travel. David says, "It took me a long time to come up with this design, but it's fairly simple." The wing also came in for some changes, but David still retains the spruce spars and the wire cross-bracing. It does feature aluminum ribs between the spars, made of alloy 5053 H-32. He describes the ribs as every easy to make. The aircraft includes flaps, as well. Note that the wing tips are foam and fiberglass rather than the laminated bows used on the Fly Baby. A similar technique is used on the tail feathers....the blue foam and fiberglass replacing the bows as well as being used on the leading edges. "Easy to make, very durable," says David. missions up to 2 people, full gas, and 40lbs bags balancing between 15% to 30% and that was with only panel and fabric to guess at." The airplane will be using an 0-200 from a Cassut racer, and David has designed in adjustable seats that have been tested with people ranging from 6'5" tall to 5'4" tall. This is David's second homebuilt. "I built a One Design in 2 years, but this one is taking forever. I'm an airline pilot and have had many setbacks over the past 2 years, but I swear I will have it flying by this time next year!!!!!" It's interesting that this airplane incorporates various changes that have been suggested from time-to-time...something other than wood for much of the construction, shock-absorbing landing gear in the monoplane configuration, two seats and enclosed cockpit. I'll add updates as time goes by.